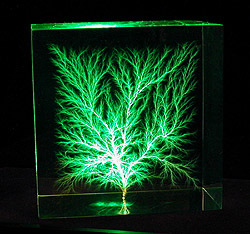 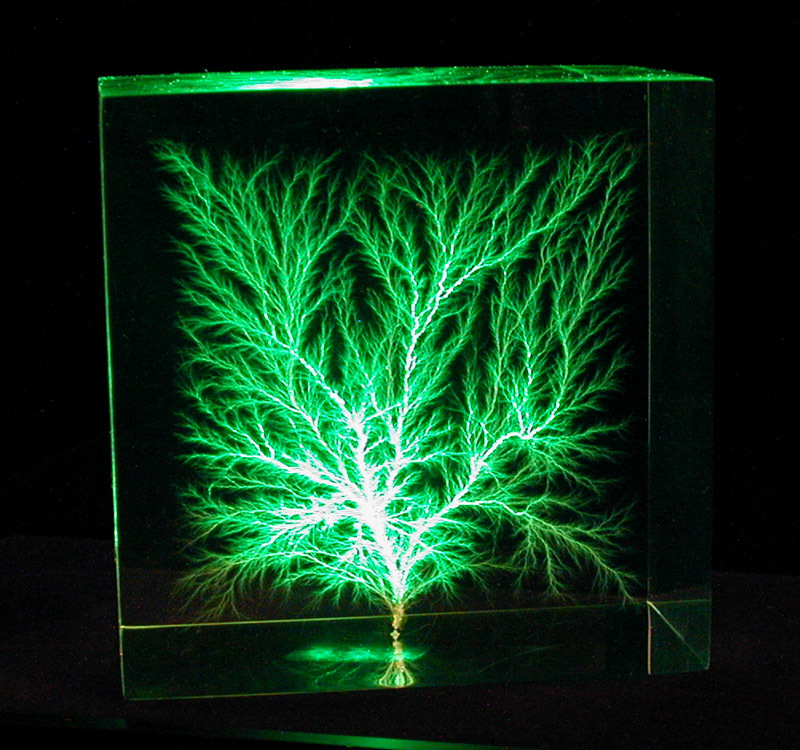 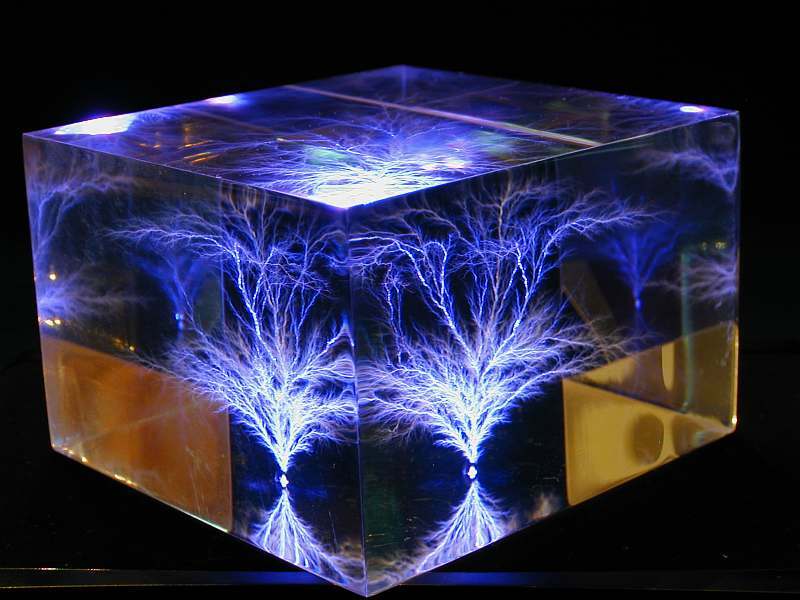 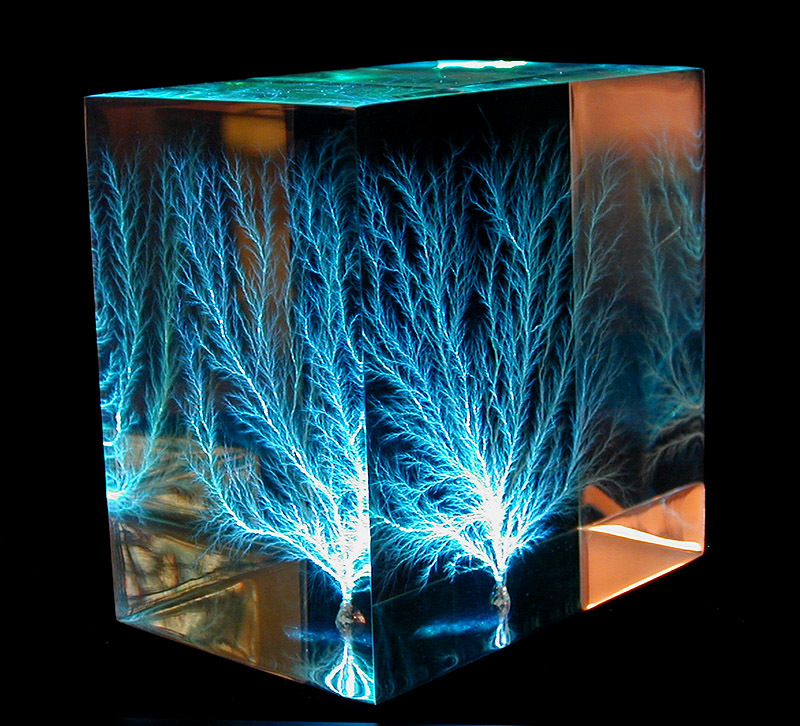 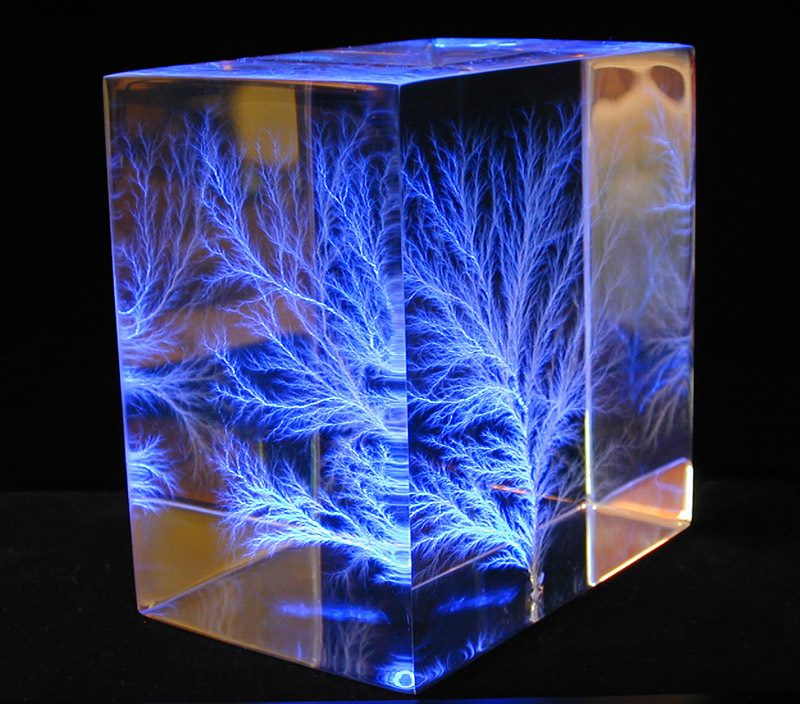 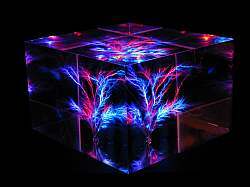 Some sculptures have two virtually independent parallel discharge planes connected only by a single discharge root. 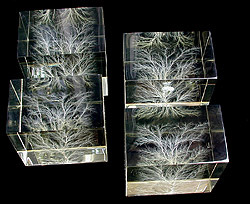 Some exhibit branched dendritic discharges, others have "snowflakes" (small tuft-like discharges that resemble individual snow crystals), while others are wildly chaotic with seemingly random fluffy "cotton-candy-like" discharges. 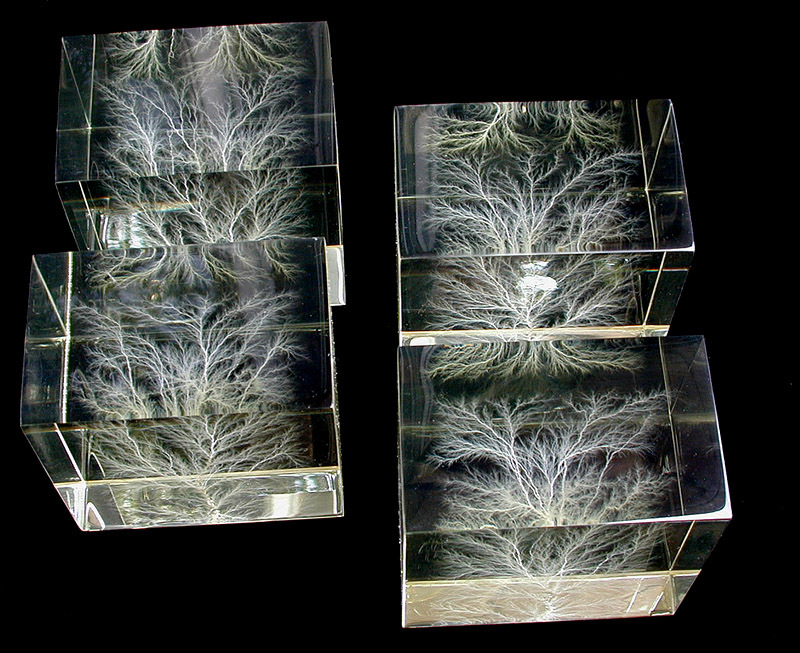 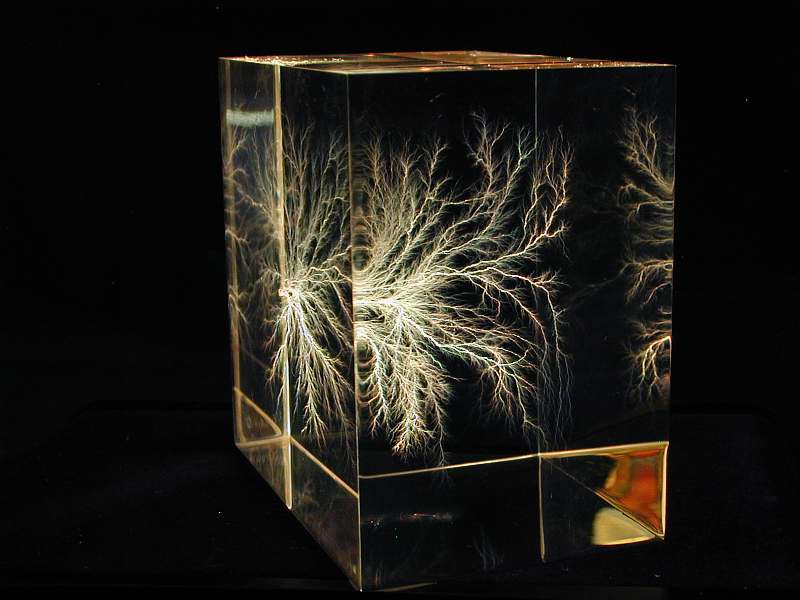 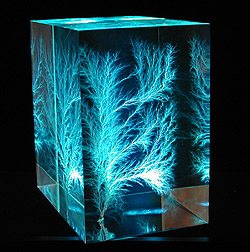 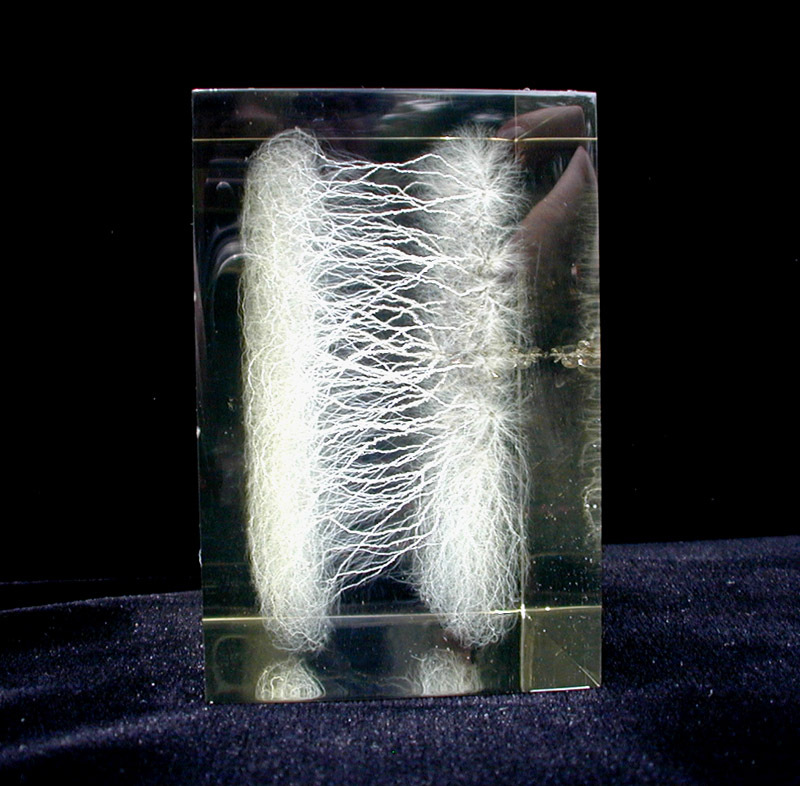 Many specimens show various combinations of dendritic, chaotic, and snowflake discharges. 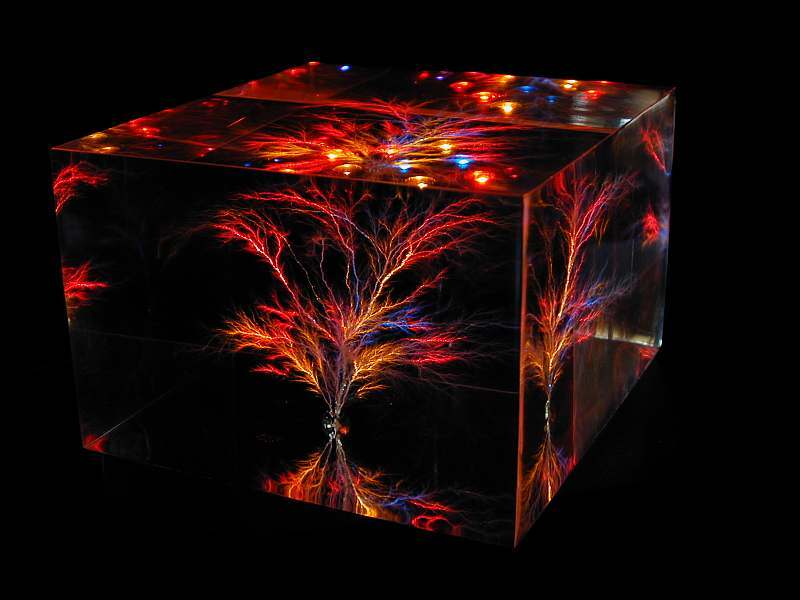 Although the internal patterns vary from specimen to specimen, we guarantee that you will be fascinated and satisfied with your purchase. 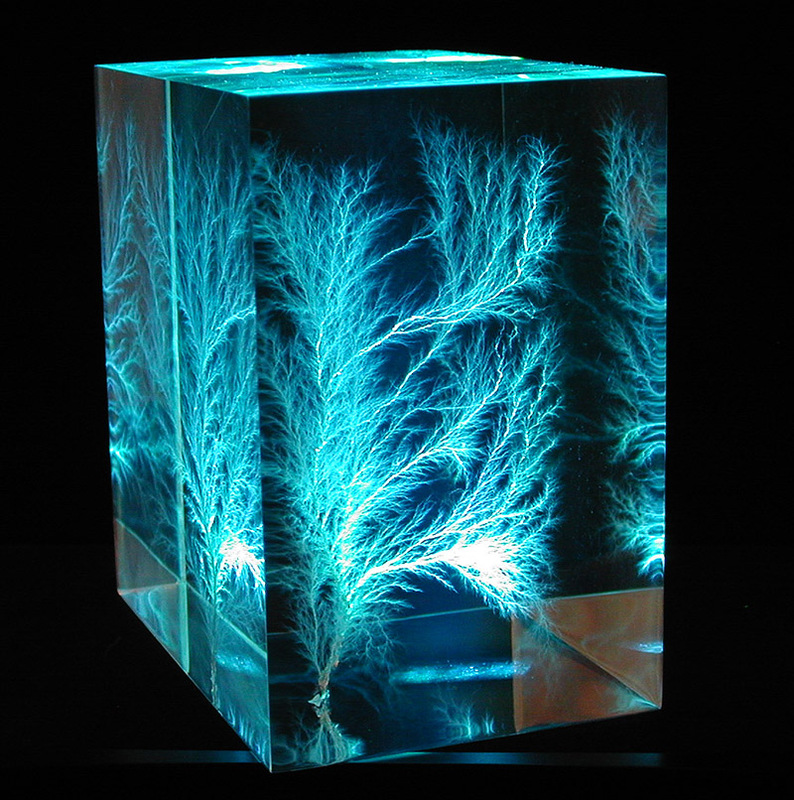 These specimens were created from blocks of high quality, crystal-clear cast acrylic. 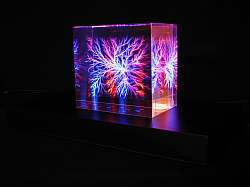 The following images do not begin to capture the depth, clarity, and jewel like character of these 3D figures. 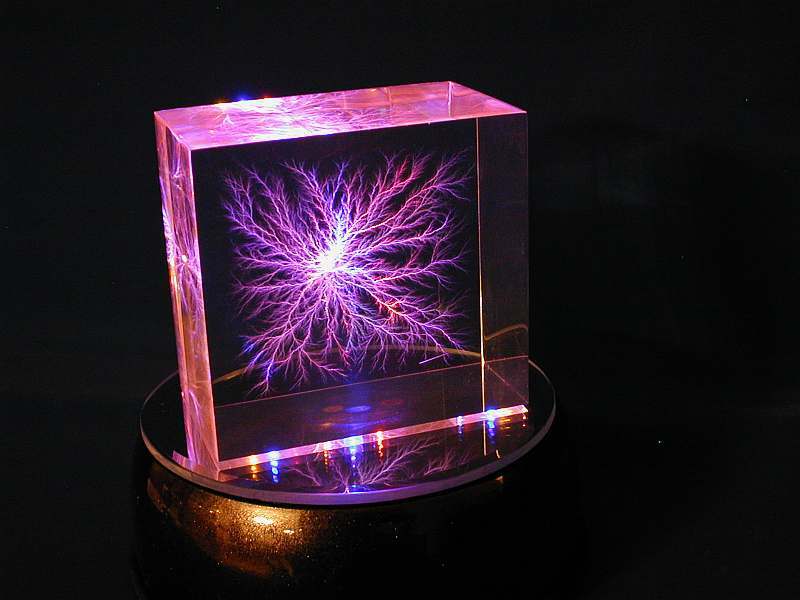 When illuminated by a multicolor or rotating LED base, these become sparkling treasures of scientific art. 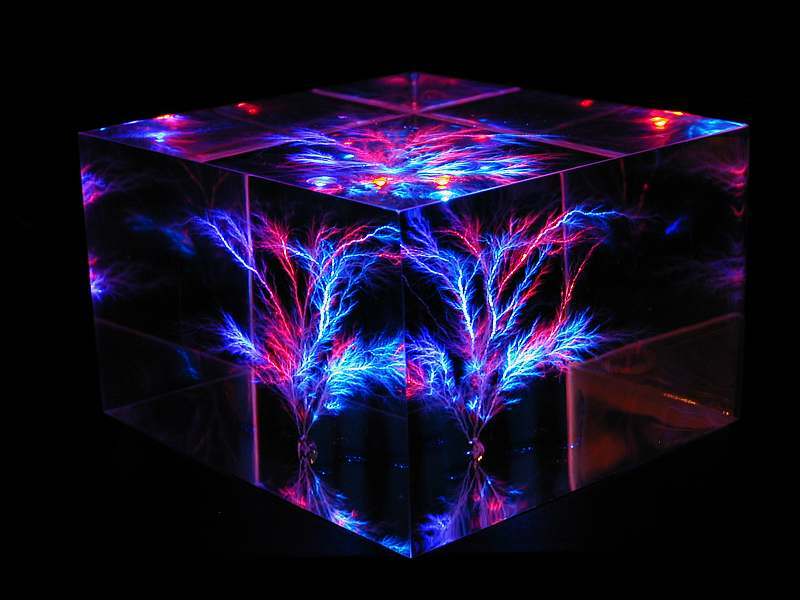 Laser crystal art can't begin to match the exquisite detail, intricate complexity, and infinite variation of the fractal discharges within these prisms. 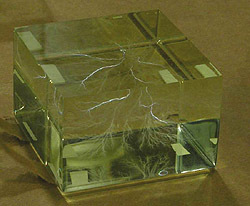 Newer specimens may also exhibit solarization - amber colored layers between the irradiated surfaces and the discharge. Solarization layers may also fluoresce when illuminated by blue or near-UV LED's. 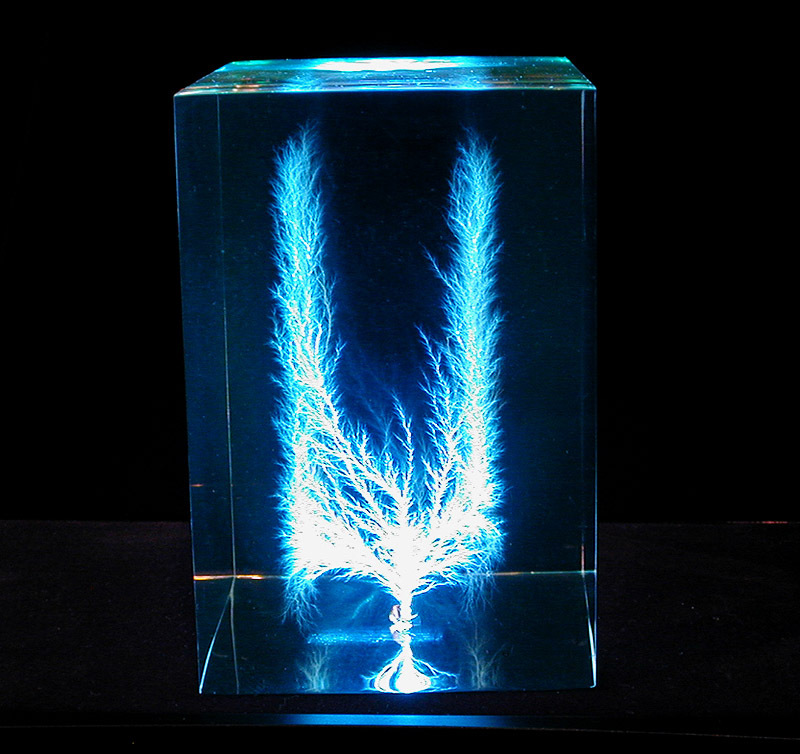 Solarization, and its associated fluorescence, usually disappears with time. 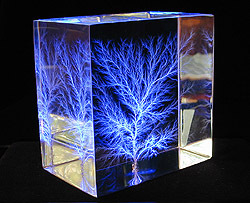 Please select which type(s) of discharges you prefer (i.e., African Tree, Windblown Lightning, etc. 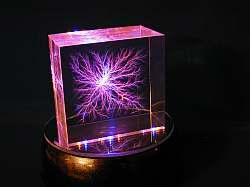 ), and we will try to find one that matches. 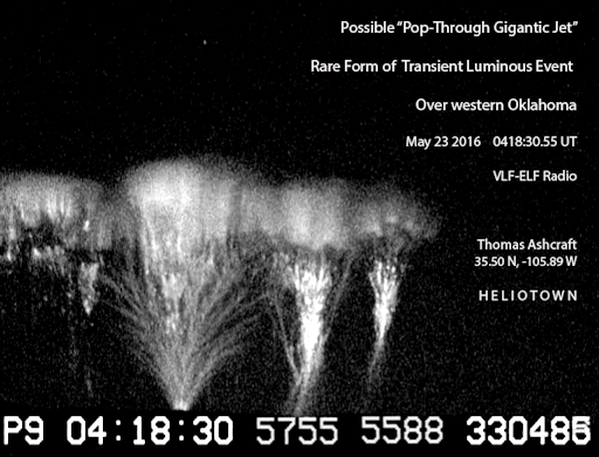 Some styles, such as "Heavy Weather", underwent multiple discharges while being irradiated by the electron beam. 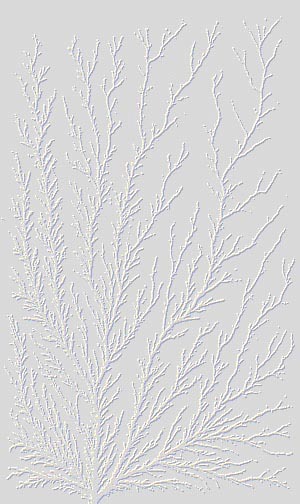 This caused repetitive discharges that created a bit of darkening of the main discharge paths which adds a different character to the piece. 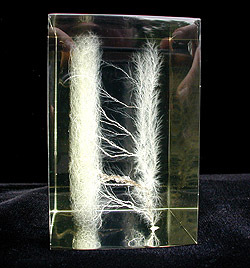 The darkened areas disappear once the specimen is illuminated. 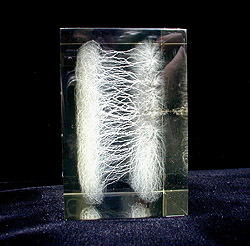 However, some customers may find these specimens less appealing. Rest assured that your satisfaction is always guaranteed by Stoneridge Engineering. 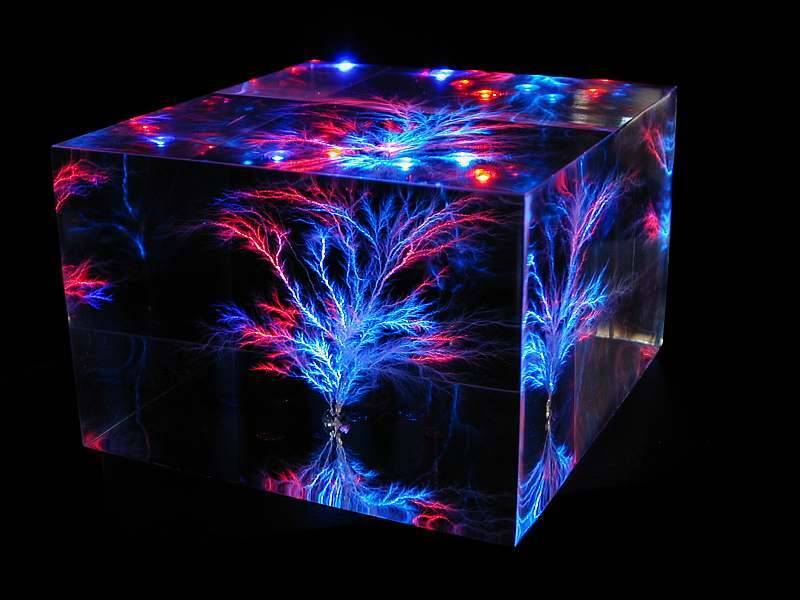 If you are not satisfied with your purchase for any reason we will gladly offer to replace your item or provide you with a full refund! 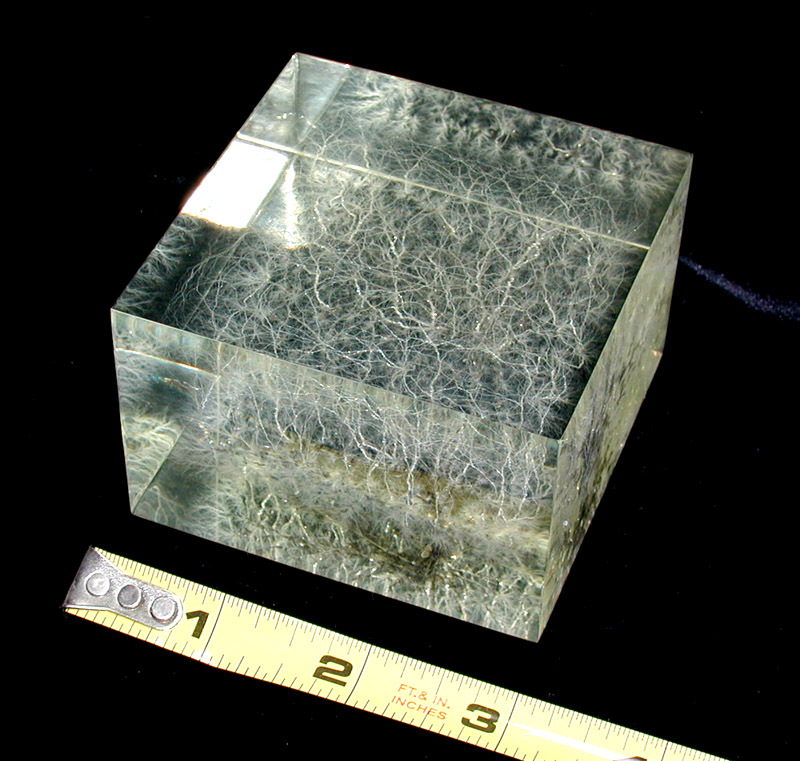 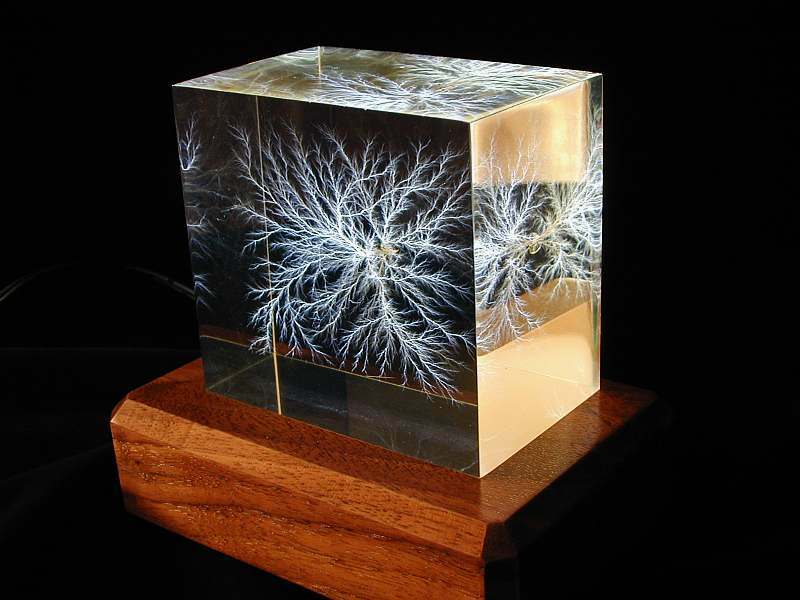 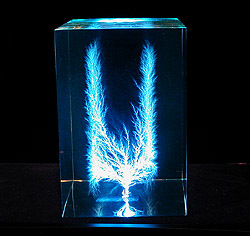 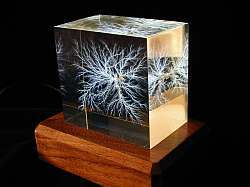 Another view of previous "Parallel Planes" prism showing dendritic structure of the discharge layers. 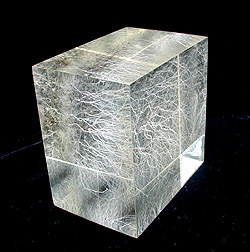 Rotating 3-D view of a "Heavy Weather" sculpture. 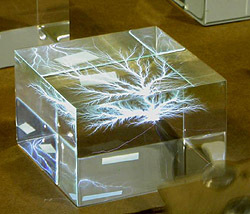 Once the image has been fully downloaded, drag your mouse over the image to rotate. (Courtesy Theodore Gray) Rotating 3-D view of a "Heavy Weather" sculpture with discharges between a dendritic and chaotic discharge planes. 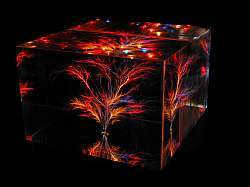 This pair of images can be used with 3-D glasses or by de-focusing your eyes! 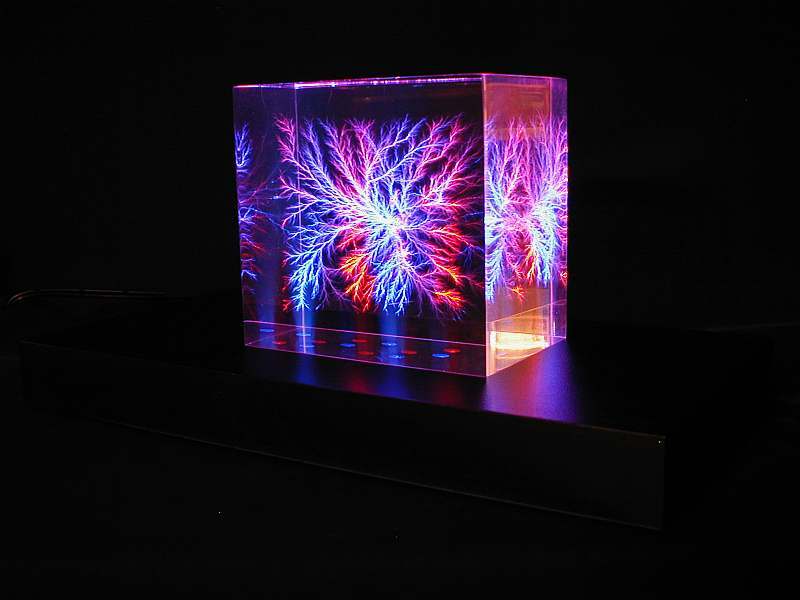 Once the image has been fully downloaded, drag your mouse to rotate various views of the sculpture. Copyright 1999-2018, All rights reserved. 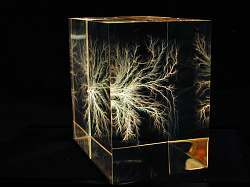 No portion of this web site may be reproduced without our written consent.